The Long-Tail Cast on is often referred to by many other names in the knitting community. Some of which include but are not limited to Sling Shot, Continental, and Two Strand. In my opinion, this is one of the best of the most basic cast ons. Why you ask? It is stretchy without being too loose. The cast on actually creates a knit row of stitches. Therefore, when you turn your work you will see the purl bumps on the other side. And let's face it, it looks cool to others when you doing it! Using only one needle and the yarn you want to use for your project pull out a length of yarn about three times the length of the width of your project.This becomes the "long-tail". Make a slip knot and place it on the needle. Hold the needle in your right hand with your right forefinger on the knot to hold it in place. The long tail should be on the left side of the needle and the working yarn on your right. With your left hand put your thumb and forefinger together and insert them between the two strands of yarn hanging from the right needle. Spread your thumb and forefinger apart so the long tail is hanging over your thumb and the working yarn is hanging over your forefinger. Put the needle on the outside of the yarn on your thumb and scoop the needleunder the yarn towards the right. Bring the needle over to the outside of the yarn on your forefinger and scoopthe needle under that yarn towards the left. Bring the needle back toward the thumb through the loop created by the thumb yarn. Now, let the loop on your thumb slide off. Don't panic, it is okay! 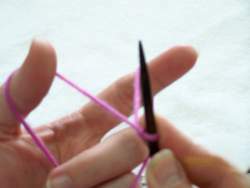 With your thumb, use the long tail to tighten the loop on the needle by pullingit. You have just created a stitch! Repeat these steps until you have the amount of stitches you need to cast on. Little Tip: remember that this cast on produces a knit row of stitches.This is important because if your instructions say to cast on and then knit 1 row, youknow that using this particular cast on has already put that first row on the needles foryou. Therefore, when you turn your work you will see the purl bumps and you know that youshould start on row two of your instructions. Here, take a look at what I mean. This method takes longer to type out than it takes to accomplish so don't let the detailed instructions scare you away. Give it a try. It might take a few timesof practicing to get the right tension but trust me, this will be one of your most used cast ons!